Loved by customers, their random shape & nature’s unusual designs command a lower price! But we guarantee every Crafty Coronet will be 100% A grade, natural deer antler dog chew with variety and naturally unique shapes. 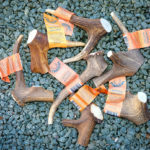 Staglers Deer Antler Dog Chew – Crafty Coronets. Sold individually. Offered from pride of place in the Odd Shaped Section of our Store! The coronet is the hardest part of the antler and all these chews include a coronet. As seen in the picture they are shorter and stubbier than Jumbo’s but VERY dense!! Coffee cup not included, its for size illustration only! This deer antler delight is highly competitive price due to the weird and wonderful shape. You will be getting our minimum Jumbo weight of 350g (most of them are well above this weight) and still the finest quality but they will not be as long and straight as the main jumbo’s you can also buy! Because of their random shapes & nature’s unusual designs you get a lower price! 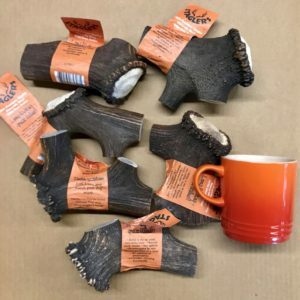 We guarantee every Crafty Coronet will be 100% A Grade, natural deer antler dog chew with variety and naturally unique shapes, hence the price! A superb Opportunity to try the bigger chews but at great value for money as it will last and last – good news! They say big is best and if you have a really big dog, or a dog you want to keep busy for a long time then this is going to be the answer. If a German Shepherd cannot get through it in 6 weeks then you know that nature has provided the answer! The Staglers Deer Antler Dog Chew – Crafty Coronets is guaranteed, premium quality antler which is naturally shed from wild deer annually. This, like all of our chews, is totally natural, unprocessed, clean, nutritious, long-lasting and a great treat for all dogs. Theses are fantastic, and will still weigh in excess of 350 grams! Suits the bigger dogs. NB: Owing to the unique shape and size of the Crafty Coronet, we can only find so many that meet our strict quality control, because we really do want to provide something that bit special and ensure that’s exactly what it is. Stock levels of these amazing creations will therefore vary, but we will always try to accommodate. Each spring male deer they lose their antlers, after mating, which will then start growing again, year on year. 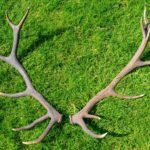 Our antlers are collected from free ranging deer in southern Europe, brushed, hand cut and graded on weight. As antler is a purely natural product they all differ in colour, weight, shape and thickness. We guarantee we only buy the Top Grade A, premium quality antler we do not buy lower grade, white antlers, as these do not last long and can splinter. Our Ethos is to be as eco-sustainable as possible, from process to packaging. Finally, Please Give Responsibly Some dogs will chew a Stagler all day if you let them. Please do not. It is very important that you monitor your dog whilst chewing and do not leave it with them for too long. After all you are giving a hard, nutritious treat!